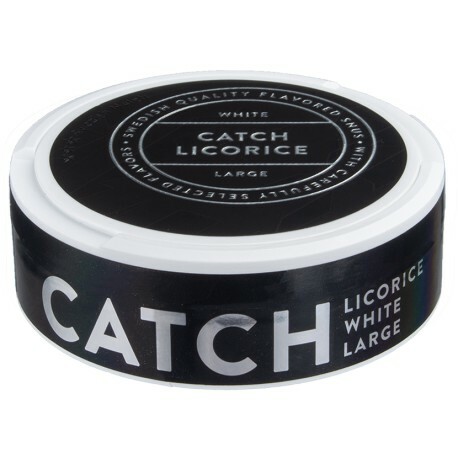 Catch Licorice White Portion snus has a gentle tobacco character with a prominent taste of licorice. It comes in a white portion pouch meaning the portions did not go through an additional rewetting process. This makes them drier to the touch and gives the pouches a whitish color. Catch snus is made by Swedish Match, the largest Swedish snus producer in the world. These have a nice salty sweet licorice flavor at first and drip pretty slowly, but about 30 minutes the drip starts to get weirdly bitter. My first licorice snus so I’m not sure if they all do that...but these did for me. I was expecting something sweeter. In my home town there are licorice plants that we used to pick and chew on as children. There's a little hint of saltiness before the sweet licorice flavor kicked in after chewing on the plant. This tobacco only offers that saltiness of the licorice but not the flavor of it. It did bring my back to my childhood, but as it wasn't what I wanted I have to rate this lower than 3. Otherwise, it's a 3. Pretty good to start with on account of its tobacco content. The licorice is mild, but the tobacco is good and the flavor is long lasting. The General Classic Licorice and XRANGE General Salmiac suited my taste better for a licorice, but sadly they have been discontinued. Let me start this review by saying that I am not a huge licorice fan, but Catch Licorice is pretty mild in terms of flavor. What I did not realize, is that tobacco mixed with a light licorice flavor can be pretty tasty. That is precisely what this tastes like. I had always thought that I would never like any licorice flavor on anything, but Catch has changed my mind. It made me want to try other snus with licorice flavor. Not bad. Not fantastic. It could use more licorice and less salt. Tastes more like ouzo than sambuca. I don't hate it, it's just a bit of an acquired taste.